Individually portioned potatoes on Thanksgiving are a holiday miracle, y’all. 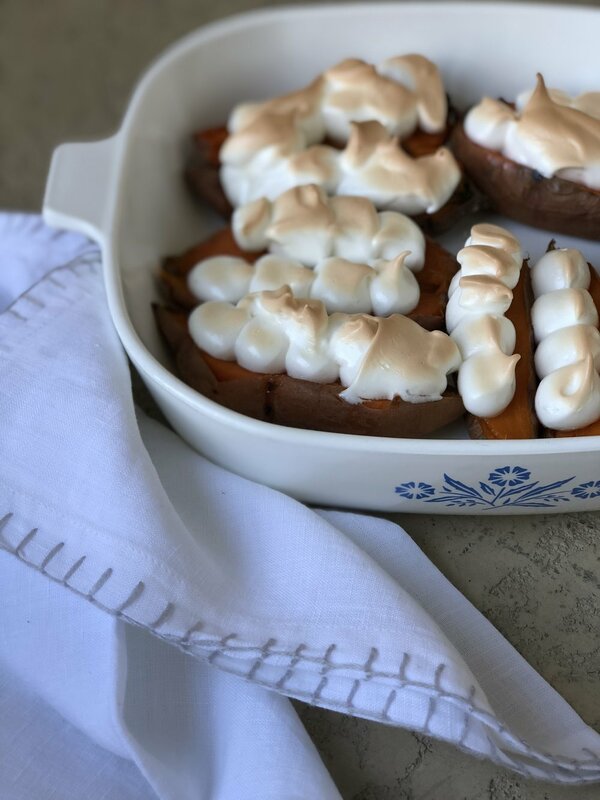 No need to overthink the portion allocations among another casserole dish; simply count your number of Thanksgiving or Friendsgiving guests, hit up the mini sweet potatoes at Trader Joe’s, and count accordingly. Plus, these little ones are super adorable. 1. Preheat oven to 375 degrees. Pierce potatoes with a fork and place on a parchment-lined baking sheet. Bake until tender, about 45 minutes. Remove from oven and allow to cool on baking sheet for 15 minutes or so, until safe to handle. 2. Increase oven temperature to 400 degrees. Half each potato lengthwise and carefully scoop potato center into a medium bowl, leaving about 1/4 inch of pulp around each shell. Return shells to baking dish. 3. Add milk, butter, salt, pepper and nutmeg to bowl of potato pulp; use a potato masher to combine until smooth. Then, carefully spoon potato back into each shell. 4. Beat egg whites and cream of tartar on high speed until foamy, about 30 seconds. Add powdered sugar, one tablespoon at a time, until stiff peaks form, about 3 minutes. Use a spatula to carefully transfer meringue into a Ziploc bag. Cut 1 inch off a bottom corner of the Ziploc, and pipe dollops of meringue atop each potato. 5. Bake at 400 degrees until meringue is golden, about 6 minutes. Transfer to a platter and serve immediately.